Home > 2014 > July > So You Say You Hate Auctions, But You Love Worker Placement? Auctions used to be all the rage in the euro side of modern boardgaming. As I’ve said before, an auction can fill a lot of roles in the game designer’s toolbox. Especially since eurogames don’t tend to have all that much interaction between players, having an auction can actually give people a way to affect their opponents and require players to pay attention to what others are doing. In addition to that, auctions can help balance out actions or resources that may not be exactly equal in value or benefit. And maybe more than anything else, auctions also introduce a really cool level of depth in that it takes experience and knowledge of the game to properly evaluate the relative values of the different things at stake. And in general, I like auction games for all these reasons and more. But I’m also aware that not everyone shares my opinion, and I’ve heard from a number of people through the years about how new players can have trouble or even ruin an auction game through making poor valuations, how auctions can take too long and dominate the play of a game, and how they can maybe even be a shortcut used to spackle over a poorly-balanced game by lazy designers. Again, I’ve tried to address these complaints in the article I linked to above, and instead, I wanted to make another point briefly here today. You see, some of the same people I’ve heard complain about auctions in the past have also gone on to proclaim their undying love for the Worker Placement mechanic. Of course, I just went into a lot of detail about worker placement my last podcast episode, and hopefully between that and just, you know, being a relatively conscious gamer for the last 9 years or so, you all have a pretty good idea of what that means. But what I find strange and a little amusing is that, essentially, worker placement is just another type of auction. Specifically, it’s a simultaneous Dutch Auction. The way a Dutch Auction works (in case you don’t already know and didn’t want to click on the Wikipedia link I provided) is that an item is put up for bid for a price that is way more than anyone would pay. And then over time, the price decreases until somebody jumps in and buys it. The action spaces around the board are obviously the items up for bid. What is a little less clear, however, is what the currency really is. Of course, in some worker placement games, you have to pay some sort of money or resources to take various actions, but that’s not the real currency in the auction I’m talking about. 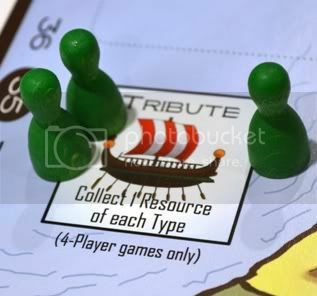 Instead, the most important resource in a typical worker placement game is your priority. A pretty direct analog would be the auction game Ra, where players have a set of discrete and uniquely-valued sun tokens that they use to bid on lots of tiles. 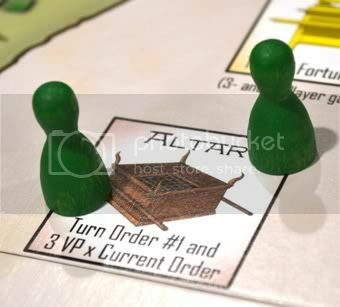 In a worker placement game, the starting player in a 3-player game would essentially have the possible “bids” of Priority 1 (the highest value), Priority 4, Priority 7, and Priority 10. And at the beginning of the placement phase of the turn, the “price” of any action they would take would be Priority 1. After that one action is taken, the price of everything that wasn’t chosen drops to Priority 2, which is a value that only Player 2 has (meaning that it’s his turn to place). And in addition to having a similar structure to a Dutch Auction, it’s also pretty easy to see that the role served by Worker Placement is very similar to that of Auctions. Like I said in the podcast, one of the main reasons to include worker placement is to introduce a level of player interaction into an otherwise “multiplayer solitaire” euro-style game. 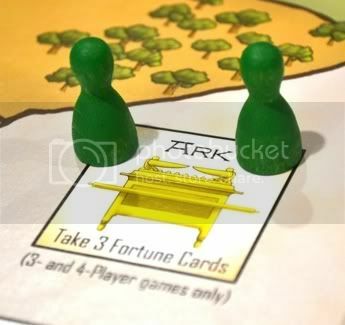 Like I just said, prior to the invention of worker placement, auctions were a popular tool that designers used to bring indirect conflict and player interaction into this type of game. Even more than that, what really mystifies me about people who love worker placement and dislike auctions is that the thought process and “skill” involved in both are very similar. Both mechanics require players to continually evaluate their priorities and how much taking any particular action is “worth”. They need to be able to understand how much benefit any particular investment will yield for themselves, as well as keeping an eye on other players and trying to evaluate how much it would be worth to them. Because to play either type of game well, you want to invest as little as you can while still getting the items that you need to be successful. I’m not trying to claim that I’ve come up with some sort of Grand Unification Theory for game mechanics here, or even that I’m the first person to make this comparison, but I did want to call some attention to it. So, what do y’all think? Does this make sense? Does it make you question any former ideas you had about your preferences for one mechanic over the other? I’d love to hear from you! I have often said that the auction is my least favorite mechanism in games, but I have to admit that it’s been growing on me. I like auctions that are done WELL – the incremental auctions where people just increase the bid until someone is the last one remaining, or the once around auctions, or the blind bids all feel like lazy design choices to me, and I really dislike those. And I really hate auctions for turn order. I tend to prefer the games were several auctions are going on simultaneously, as in Cyclades or Keyflower – the ones that, yes, are more like worker placement. I think I like worker placement better because I can see my options better and have more of a sense of the order I need to play things in to give me the best chance. In auctions, I might know what I need, but I don’t know what the best to pay. And if I back myself into a hole, there’s not usually anything I can do about it. Next Post: My Kids are Growing Up a Little… And So Are Their Games!